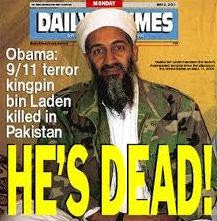 The fate of Osama bin Laden's remains have been called into question after emails leaked from an intelligence analysis firm say the body of the terror leader was actually sent to the U.S. for cremation. The emails were allegedly obtained by the hacker group Anonymous from Stratfor, an organisation dealing with analysis of intelligence and geopolitical analysis. It's also known as the 'Shadow CIA'.